Behold the winged cap of Asterix, the most famous ancient Gaul of modern times. Asterix is, and was, an extremely popular comic book character that was popularized in France and spread like wildfire to be translated in almost every language, becoming a global phenomenon. Along with Obelix, Getafix, Dogmatix and others, the little fiercely independent Gaulish village from Armorica (northern France) where Asterix lives spawns numerous exploratory adventures in 50 BC, spanning the entirety of the Roman Empire. 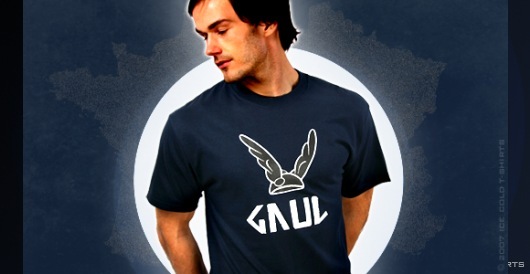 A must have for any Gaul, or Gaul enthusiast, this vintage shirt has a nicely faded and rough drawing of a winged cap, one of the many minute but expressive details stuffed into the world of Asterix.